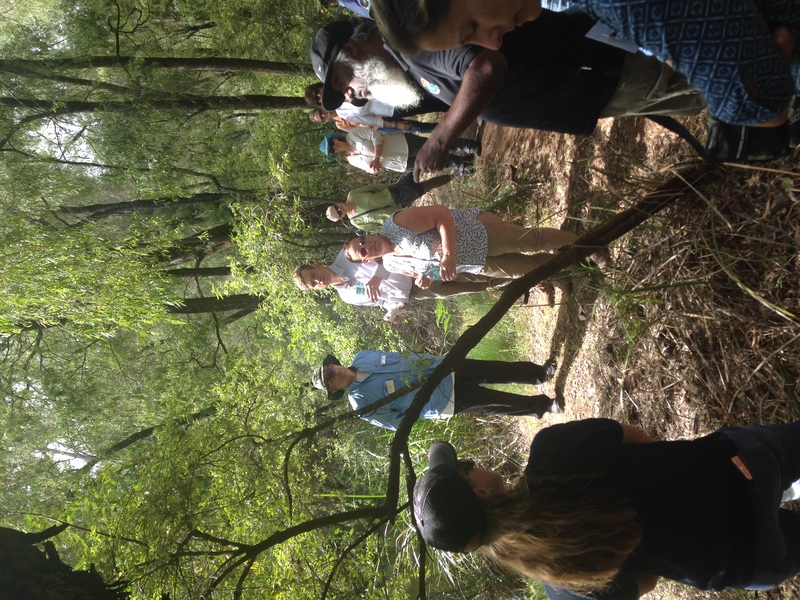 Last week I headed down to Collie to hang out with the Natural Resource Management (NRM) community at the South West Catchment Council’s annual Celebration event. 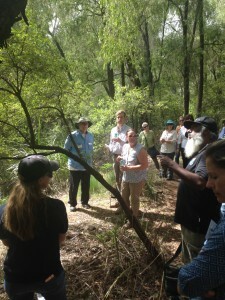 Gaia Resources has had the pleasure to attend these events for several years, and it has traditionally been a chance for us to celebrate success stories and learnings with our original GRID customer and their tight network of Landcare and community groups. We have also developed several Citizen Science mobile apps and web mapping solutions used by the NRM community, so it’s a great opportunity to catch up on how those projects are running. Troy Bennell from the Ngalang Wongi telling the cultural story of the area around Honeymoon Pool, Collie. 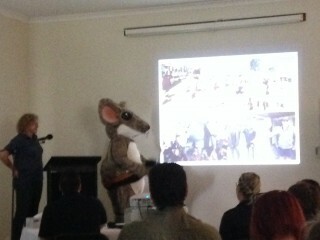 Being only one year into my role with Gaia Resources and my first time in Collie (and to this event), I wasn’t sure what to expect; but the packed set of talks gave me an inkling that I was in for a good learning experience and a bit of fun. The event didn’t disappoint. We had a field trip, an aboriginal cultural tour, mountain biking excursions, mascots, mascots in a dance-off, politicians, politicians dressing up as mascots (no, not really) – and yes – good old networking and inspiring presentations on a range of NRM topics. There were some good insights provided by Adrian Ward (Wentworth Group of Concerned Scientists) and robust debate on economic, political and psychological drivers behind environmental funding and programs. With the National Landcare Program – Phase 2 funding round and competitive tendering process underway, understanding these drivers and how they translated into local projects was on the mind for many in the room. Alannah McTiernan made some State funding announcements and stressed the importance of sustainable farming initiatives and getting funding to the people on the ground. Many of the talks though were showcasing the fantastic work of NRM staff and volunteers throughout the region – from tree planting, to dune rehabilitation, to youth education programs, bike and 4WD track maintenance and working with dairy farmers. The best part overall to me was being able to hear about the activities dedicated people are doing on the ground to help manage our natural environment, and the challenges they face in trying to make every dollar stretch as far as possible. On the drive home, my mind was buzzing around how we at Gaia Resources are already preparing to help with that “value for money” challenge. The first lightbulb moment I had… we’ve been putting a lot of thinking into a stripped down mobile friendly version of GRID, one that would support exactly those Landcare people on the ground by making it more efficient for them to capture their activities in the field. This would translate into less time and resources spent back in the office entering data from paper and excel into GRID. There are also many mobile applications out there that can do a great job (see our Mobile GIS blog), so we haven’t forgotten there may be a need to integrate GRID with one or two of them. The challenge is designing something that requires little or no training, and supports a set of specific NRM workflows. The second lightbulb moment was around being able to tell a good story. These small groups rely heavily on grant funding from State and Commonwealth bodies. Banks (like National Australia Bank) and other private organisations are also recognising the need to invest in our environment, and are joining the party with their own grants programs. Hence the other way we can help – so my drive time thinking went – was to help these groups to compile their historical activity data in GRID, generate statistics and other products that helped tell a compelling story in their grant applications. GRID has a lot of filtering and reporting functionality released in the last year that can get them there, and QGIS is a powerful tool they can bring to bear for more sophisticated processing. Of course GRID already delivers a lot of value to the NRM organisations – letting NRM staff be self-sufficient, and letting NRM GIS staff get on with some of the more interesting and powerful analysis that the NRM community need. And, as Simon and Piers were discussing in recent blog comments, there’s some changes to the way we run QGIS training that will also deliver good value and impact to the NRM community, so stay tuned for that. Finally, I have to say a big thanks to Damien Postma and all the SWCC crew who welcomed me in, and hosted such a great event. While the rest of the team were in Perth moving offices, I got to spend a very interesting and fun couple of days with our clients, learning more about what they do and how we can help them – something we’ll get stuck into straight away now we’re settled into our new offices. P.S. If you want to know more about the conference, or about some of our work above, then feel free to drop a comment below, or start a conversation with us on Facebook, Twitter or LinkedIn.